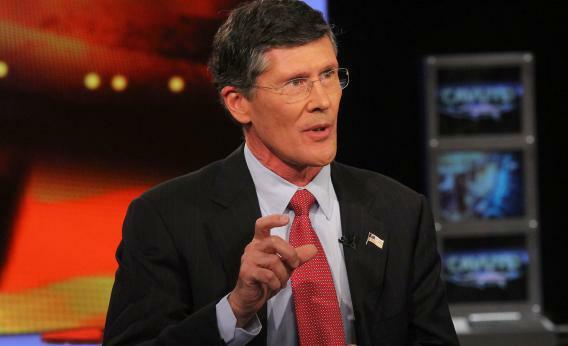 Wall Street compensation and John Thain: The grimmest story you’ll hear today about Wall Street pay. Photo by Rob Kim/Getty Images. Sheila Bair, former chair of the Federal Deposit Insurance Corp., one of the few heroes to emerge from the financial crisis, has written a marvelous new book, Bull by the Horns: Fighting to Save Main Street from Wall Street and Wall Street From Itself. Bair was in the room when the major bailout decisions were made, and she was one of the few pushing for real accountability from Wall Street and real protection of homeowners. In the book, and on Wednesday night on my Current TV show, she told an amazing vignette. The infamous TARP funds were being discussed with the CEOs of the major banks, and they were all called to Washington for the critical meeting with the Treasury secretary. The financial world was literally teetering on the brink of disaster, and the first question asked by John Thain, the CEO of Merrill Lynch, was not about how the system could be saved, the economy preserved, the integrity of the banks upheld. No. He asked if his compensation was going to be cut. This is the guy who spent more than $1 million putting new carpets in his office, paid for by shareholders—and then by taxpayers. In a radio interview Thursday, Bethany McLean, a great journalist, made a really important point: Flawed compensation structures that gave bankers perverse incentives to take great risk at the expense of others were at the root of the crisis. She pointed out that we as a society did not, and do not, object to high pay when people perform. It is when they are compensated with huge paychecks and bonuses even when they fail—and then are compensated again and again that way—that we are troubled. We do not object to Derek Jeter’s big paycheck or even Warren Buffett’s. They earned them. The Thain vignette is so troubling because he did such harm and yet continued to feel so entitled, to express no sense of remorse, to not recognize that his stewardship had led to the troubles and that maybe there should be consequences. He and others on Wall Street personified the world of heads I win, tails you lose—or, put another way, of socializing risk while privatizing gains. Have we learned any lessons? The critical point is this: We don’t resent success, we applaud it. We don’t begrudge others the earned fruits of their labor. But we do and should resent an attitude of entitlement without obligation. And that attitude is still pervasive on Wall Street.